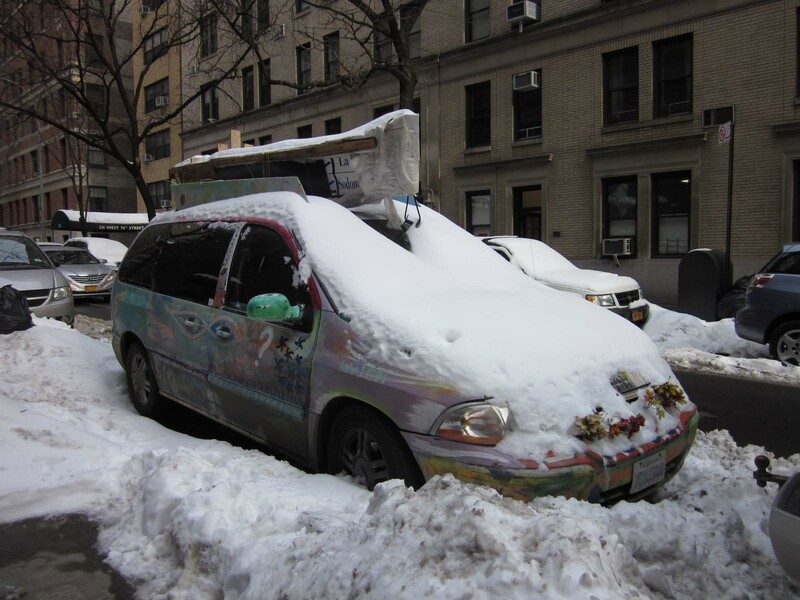 This entry was posted in Humor, new york city and tagged obsessing, signs of spring, street art, thawing, un-classic cars, Upper West Side, winter weather. Bookmark the permalink. I wasn’t sure where you were going with the minivan, but at the end, I laughed! 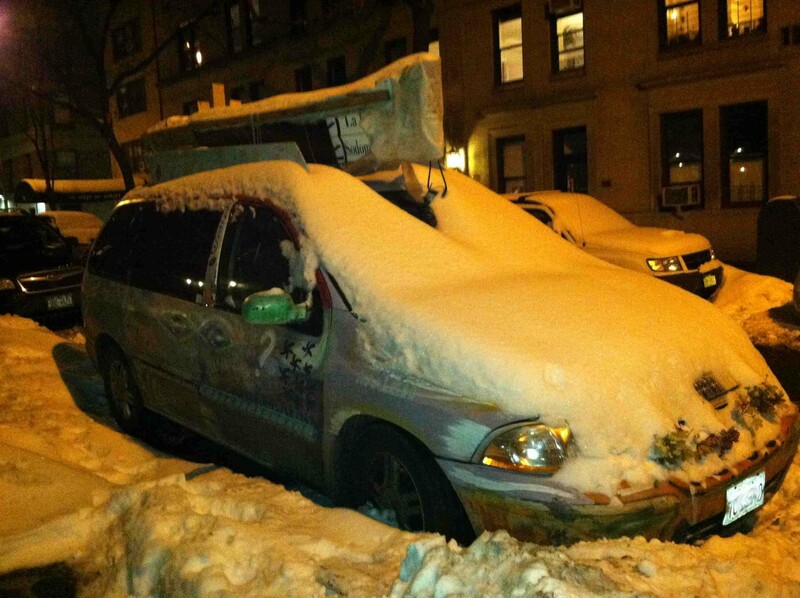 Cheers to the warming trend … but I’m still wondering what’s atop the van. Got your email, Need to respond, but busy days lie ahead. Today, it’s “only” 45, but compared to when it was 1 a few weeks ago, it’s feeling like the tropics right now, Frank. As for what’s on top of the van, it looks like a home-made canoe perfect for sinking to the bottom of a lake. That’s my guess. What’s yours? I say its the lower half of a sarcophagus. I like that guess, Frank! I wonder if it’s been used to store mummies or skis? Perfect for skis because I’m not sure what the owner knows about mummies. Good point. I don’t think they’re something you can order off Amazon. But we may be able to find shrunken heads in the Amazon. Here in New York, Frank, they might be even easier to find in the back room of any souvenir stand on Canal Street. Perfect! … and it saves time, airfare, and risk from poisonous frogs. OK seriously I’m on the train and laughed out loud as I read this post! I hope things with the minivan and mattress work out.. Their offspring would be so cute.. (gratuitous mattress pun intended )! Here’s to a happy Thawday! Sorry to burst your true love bubble, Lia, but I thing it was just a brief fling. When I visited the van yesterday, the mattress had moved on, probably to reconnect with family in a landfill. Happy Thawday back at you! There’s alternate side. Maybe it’s next accessory will be a pile of parking tickets before it’s towed. Yes I think they’ll make a nice souvenir! Maybe you’ll get lucky, Lia, and find some amongst the detritus under the melting snow. I hope that you’re referring primarily to the custom paint job and the Whatever-the-Hell that is that’s protruding from the roof. And indeed all the remnants found under the melting snow would be an archaeologist’s dream! Or the Sanitation Department’s nightmare when they unearth Jimmy Hoffa. Again I literally laughed out loud! Thanks!! Vendor display tables, seeking shelter from the storm? Here’s to some sunny days! The other night I noticed that they were returning, too, R.
Here’s to sunny days back at you, pal! I’m still wondering what that thing is on the roof, but the wonderful sun on the hood is perfect! Glad it’s warming up there, V. It’s really nice here too. Here’s to spring – I’ll raise a pint of craft beer to you this weekend. I’m referring to the canoe-type-apparatus on the roof, Cathy, as a Whatever-the-Hell because that’s pretty much a variation of what I thought when I first saw it (“What the hell is that?). Cheers! Spring is coming! Soon temps will hit the 90’s and we won’t remember the cold. It happens every year. I used to have a Windstar. Someone was watching over us during its demise….. It is indeed, Susie! Don’t remind me of the dog days of summer just yet, but yeah, I know they’re coming, too. They make me snarl. Glad you didn’t go to the wind with your Windstar. It does not sound like it’s having a happy ending like the one in my hood. I traded it in after it almost killed us! Sounds like your Windstar was related to Stephen King’s Christine! It really is scary to find what lurks beneath all this snow. Fortunately we still have a four foot mountain right on top of all the crap we left out the yard last year. I don’t expect to see any of it until June. I lost a cereal bowl lid in January. If you find it, let me know. I can still use it. That’s a hippie van, V. And one, during my heyday, I would have ridden in, most likely. Nice to have a “sign” of peace, love and sunshine peeping out of all that white stuff that has been dumped repeatedly on you guys. Enough already. I hope that nasty fast food wrappers, butts and dog poo are the worst that reveals itself once it’s all gone away. Come to think of it, Brig, it is a throwback to an earlier era, and would have fit in quite nicely in San Francisco’s Haight-Ashby 48 summers ago when I was a small fry. The other night, I was hanging out with Milton. He noticed a rat was running after us, but fortunately, we crossed the street and it darted straight ahead through pedestrian traffic into a pile of trash bags. I fear with all the snow melting, we’re heading for ratapalooza. But hey, yo spring back at ya! Loved the reveal of the van! Had one back in the day when my kids were younger and don’t know how I would have gotten through all the sports practices and car pools without it. Definitely a time where function over style just makes sense! If you get one with that paint job, you will be one cool mom. Our snow in Ohio is melting quickly, but the pot holes on the streets are really wearing on me. Glad that you enjoyed the van reveal, Nurse Kelly, but as much as I enjoyed looking at this minivan’s custom paint job, I would sooner hang glide over an active volcano naked than ever drive one. If I can’t get to where I’m going via subway or bus, count me out. I have been noticing potholes on the streets over here, too. They sure are bad news for motorists. Absolutely not my thing. You thought that was my minivan?!?! I need a vehicle about as much as I need a tumor. No thanks. One of the main selling points of NYC–one of the reasons I stayed for so many years–is because you don’t have to have a car. I loath autos and the act of driving. I was happy to be rid of it. Try getting away with that out in suburban New Jersey. Can’t be done. It’s a necessary burden. One more cold, wet blast on Friday. Then, that should be it. Beware St. Pat’s Day. Stay away from 5th Av. Rest assured that I’ve no intention to go anywhere near green bagels or green beer, either. It also offends me knowing that people like me are not welcome at that parade. On my mom’s side I’m about a teaspoon Irish. She was a mutt who primarily identified as a San Franciscan. Wise woman. I’m pleased to read the snow is finally going, LA. Everywhere looks awful when its on its way out, so I hope it clears very soon for you. The transition phase from winter to spring, Tom, is not very appealing on an aesthetic level. 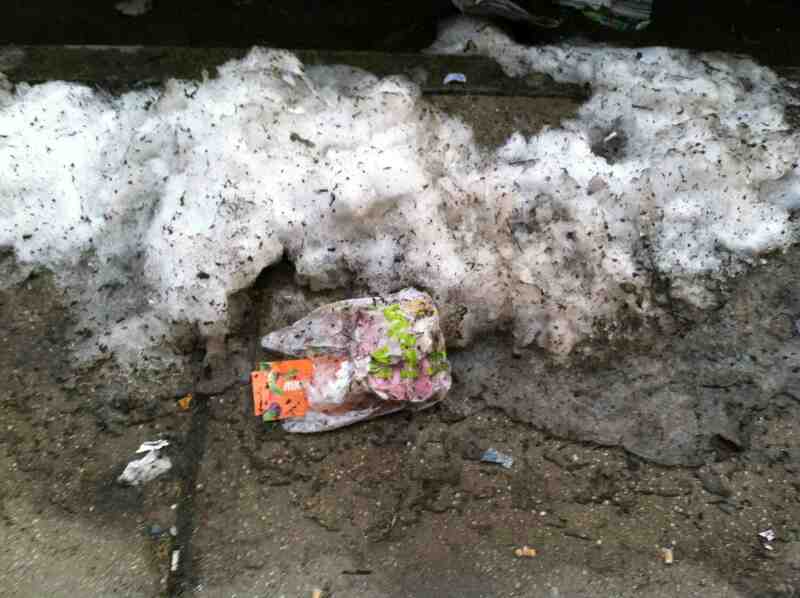 There are mounds of soot-speckled melting ice and a New York City specialty, end of winter street slime. It all seems toxic to me, but thanks to the cooler temperatures that are still prevailing, the odor is not noticeable. If the Sanitation Department could bleach every sidewalk, I’d welcome that.But at last, it is kinda spring now! I can’t believe all the crap (literally and figuratively) that was hidden beneath the piles of snow. As a dog person, I have no idea what makes people think that they don’t have to pick up after their dog when there’s snow on the ground. They know that the snow melts but the poop doesn’t, right? If they didn’t know it then, they sure must know it now! I read in the Times that a woman was so disgusted with all the turds littering her block, she spray painted them gold. Maybe she also drives that Windstar? Hey, if you look closely at the “canoe” on the roof, someone named it the “La Sodom.” I wonder if there’s a sister ship named “Gomorrah.” Hmm…. I did notice the La Sodom. On the other side is Meow. What do you make of that clue, Sherlock? I wonder who lives IN the van…what happened to the Californians? I bet they hightailed it out of NYC flip flops and all…brutal winter. I’m sooo happy with the temps finally going above -22. Everyone is so much happier and friendlier. I peeked inside. It seemed empty, unless the resident(s) were adorned in upholstery. Now that people are no longer frozen, they’ve regained the ability to smile … a little. New Yorkers are not inclined to overdo that. We must remain somewhat cranky, right? It’s 26 here to your 42….what the heck is up with that? Short answer: I live in Paradise. I did purchase bananas at Fairway on my way home from The Grind this evening. THEN YOU”RE A WHORE! A FILTHY, FILTHY WHORE! Sorry! Glad to get that out of my system. 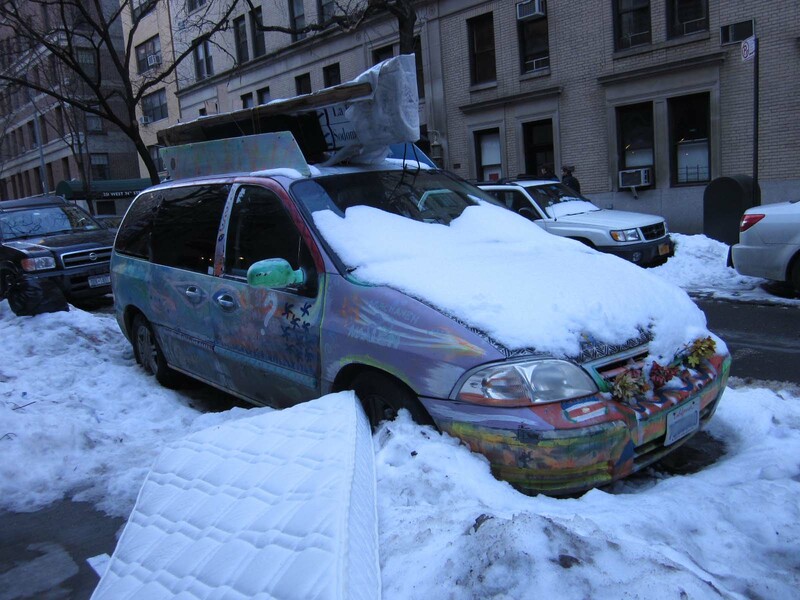 I also get fascinated by stuff like the snow-bound hippie van. The out-of-state plates would have done it. Every time I see an out-of-state plate (and I mean from somewhere where it took some effort to get here, so no Nevada, Oregon, Washington or Arizona) I wonder what brought them here. Is it a trip? Business? A sick relative? They’ve moved and they’re too lazy to switch over? Exercises like that are a reminder of life’s fun complexity. And what IS the object on top of the car? You call it a “ray of sunshine” and the words “La Sodom” (yikes!) appear to be visible, but I can’t figure it out. Gee Smak, much to my dismay, I’m not half the whore I used to be … We think alike about far out-of-state plates. The cynic in me, which comprises 99.9% of my being, tends to think that they’ve moved and they are too lazy to switch over. Sloths! As for that contraption on the roof, maybe it’s some type of do-it-yourself-badly storage? And just to be clear, because I shoot my mouth off too fast sometimes, you know I wasn’t calling YOU a whore, right? I think your reply would’ve contained more four letter words if you did, but if there’s any doubt, that’s not what I intended. I know that’s not what you intended! I was just feeling momentarily melancholy about the past. I wonder if the van owner was staying at the Alfie Arms. Kudos for correctly naming the van. Regarding the dog feces, some of the rudest people I have seen are pet owners. Tom, one of my commenters, Brigitte, implied that someone might be living in it. I think she could be onto something. Clearly, anyone who was not compelled to clean up after their dog took a squat in snow, medalled in rudeness. When you can create a bit of whimsy out of suburbia, I say it is fabulous! I don’t want to flirt with spring, no I just want to dive full on into summer. Truly I do. There’s a lot about summer that I love, Val, but when it gets super steamy hot with sky high humidity, I wilt and start longing for fall, which is really my favorite season. Awesome van. Normally I would tell you how much I hate minivans…as a mom it’s my nightmare I was so worried I’d have to convert to minivan owner when we had kids, but I was able to fight it off, however if the mini van looked like California Dreaming over there, duuuuuude maybe … Maybe. 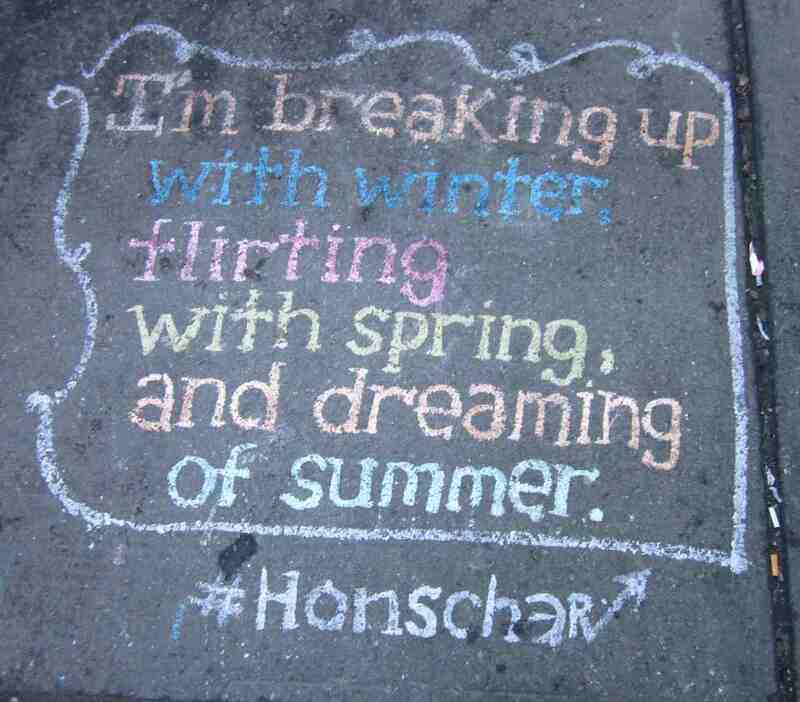 And I’m loving that sidewalk chalk sign. Glad things are clearing up for you. Sending you warm thoughts from Cali. Awwwwwwwww, thanks Guat. I’m thinking more and more that that minivan doubles as someone’s home on wheels. The owner should sell it to a museum if only to be able to afford indoor plumbing. Sending you thoughts of rain from the Big Apple, buddy. Association question: Snow-White. Looks like I may have to reconsider. I think the sidewalk chalk is on to something. It’s time to move on and leave your winter behind. It was fun while it lasted, but there’s a better way. Bruce, the snow was maybe fun for the nanosecond it was white. That’s not a very long time. In which case, one must look to mysterious buried Ford minivans for wintertime fun. 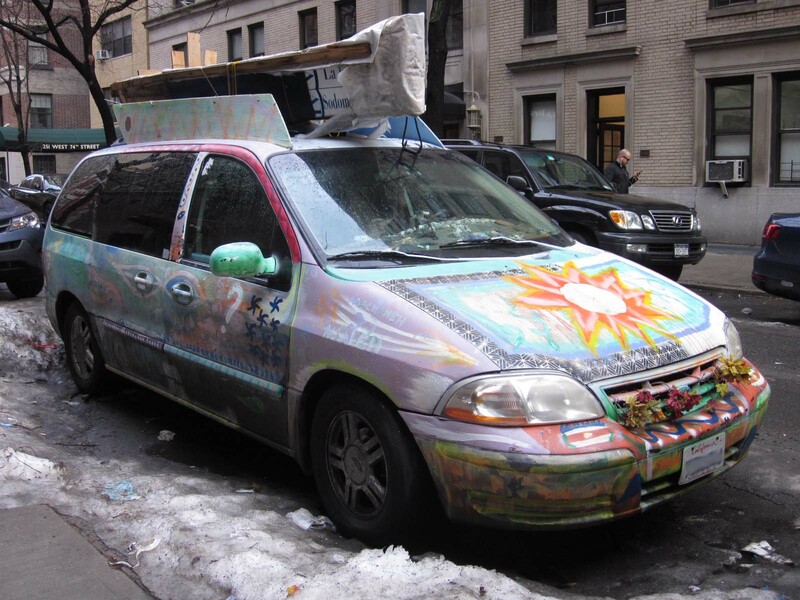 Mysterious do-it-yourself painted minivans are much more aesthetically pleasing than the piles of uncollected green trash bags buried in blocks and blocks of dirty sidewalk snow. 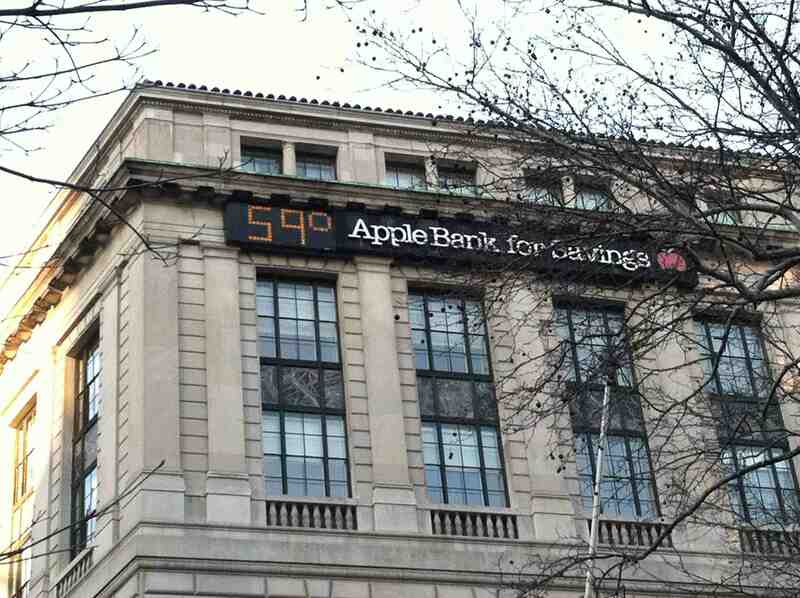 Good to know things are finally warming up there. Maybe that is a homemade surfboard topping whatever other junk is on top of the van – it is a California hippie van after all. Good suggestion, Lois! But it’s still going to be a while before anyone over here shouts, “Surf’s up!” Right now it’s 43 degrees, but that’s tropical compared to when it was 1 not that long ago. Gee, and I thought you only loved ’63 Impalas. Now, I find you’ve been flirting with a late-model minivan of all things. Shame on you! The next thing I know, you’ll be holed up inside of a Volkswagen hippie bus. Mammy Lame drove a 63 Belair, Pappy Lame had a 65 Impala. He bought his rainbow last year with a 2006 Camry in the garage. Rest assured that I will never shack up with a minivan, no matter how esoteric the paint job. That’s all the car facts I have to spew for now. As for that sign, not only is it now long washed away, the first day of spring forecast up here is for: snow! I’m so tired of winter. We got more snow today, but even the thaw will be ugly, revealing a whole winter’s worth of cigarette butts. Ugh. I don’t expect the sidewalks to be less dirty until April. I never expect them to be clean in NYC ever. Thanks for visiting and for commenting Jay!